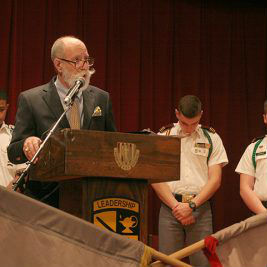 Waynesboro, VA – Fishburne Military School held its annual Blessing of the Colors ceremony yesterday. The assembled Corps of Cadets, Faculty, Staff, members of the FMS Family and friends of the school filled Lawton Chapel for what many call the most meaningful and poignant ceremony of the year. Opening songs (National Anthem and America the Beautiful) were led by FMS’ SGT Kenneth Glass, accompanied by Mr. Roger Daggy on piano and the Invocation was delivered by Dr. William Kopp, Pastor of Stuarts Draft Baptist Church. FMS Superintendent CAPTAIN Mark E. Black, US Navy (Ret. ), then introduced the guest speaker, Mr. Ethan Colvin, Youth Pastor at Sherlynd Baptist Church. Colvin urged the Corps of Cadets to consciously strive toward acting thoughtfully rather than emotionally when confronted with difficult decisions in life. “In every decision that you make in life, there is a cost that must be paid … ask yourself ‘is the prize worth the cost or price?'”. Following Dr. Kopp’s blessings, FMS Battalion Commander, Cadet Joseph Jones (South Fulton, TN) delivered the Seniors’ Prayer; Battalion Sergeant Major, Bryson Overton (Sanford, NC) offered the Juniors’ Prayer; Cadet Darian Belisle (Staunton, VA) gave the Underclassmen’s Prayer; and, Cadet Cravins concluded the student prayers by giving the FMS Cadet Prayer.